This article gives a brief overview of Foundation 4 framework and discusses Orbit feature with example. Foundation is a front-end development framework, consisting of many features which help for making responsive, mobile first websites. This framework is primarily built using HTML, CSS and Jquery. Foundation framework consists of modules in it, each can be used independently while building applications or can be used along with other modules. This framework is built with CSS SASS, a CSS powerful pre-processor, allowing us to develop our own foundations much faster and provides new tools to customize and build upon the initial styles. The Grid : You can create powerful multi-device layouts quickly and easily with the 12-column, nestable Foundation grid. Columns give structure. Typography: Foundation 4 typography is built with ems, making it easier to fine-tune your type across different breakpoints. Buttons : Foundation has a lot of easy to use button styles that you can customize or override to fit your needs. Navigation: Navigation or Top Bar helps you display a complex navigation bar on small or large screens. Forms : Foundation provides an easy to handle, powerful and versatile form layout system. UI Elements: UI Elements or Panel is a simple, helpful Foundation component that enables you to outline sections of your page easily. Section : These are similar to tabs as a way to selectively show a single panel of content at a time. Orbit : Orbit is an easy to use, powerful image slider that's responsive, allowing you to swipe on a touch-enabled device. Reveal: Reveal is a jQuery modal plugin making Modal dialogs, or pop-up windows, easy for you to use. Clearing : This feature gives similar effect of responsive lightboxes with any size image. Magellan : It is a style agnostic plugin that lets you style a sticky navigation that denotes where you are on the page. Joyride: It is an extremely flexible plugin that gives users a tour of your site or app when they visit. Tooltips : These provide extra inforamtion about an action or term on a page. Interchange : This feature uses media queries to load the images that are appropriate for a user's browsers, making responsive images a snap. Abide : This is an HTML5 form validation library that supports the native API by using patterns and required attributes. Default CSS - This version of Foundation includes smart defaults and doesn't require Sass or any other tools installed. Custom CSS - You can customize your build of Foundation to include or remove certain elements, as well as to define the size of columns, colors, font size and more. Sass - Foundation is built using SCSS, and you can work with it in the same way. Images folder (img): This folder is empty . index.html : A sample structure for the content of the page, that can be used as a template or a basic structure of our pages in our project. In the next section I will discuss about the Orbit feature of the Foundation 4 framework. Now let us build Orbit in our above HTML code. We will use three images for this. Orbit has swipe functionality that makes it easy to switch slides. On screens without touch interfaces, you'll see bullet and arrow navigation if you have the options setup in your JS. First create a list of images. 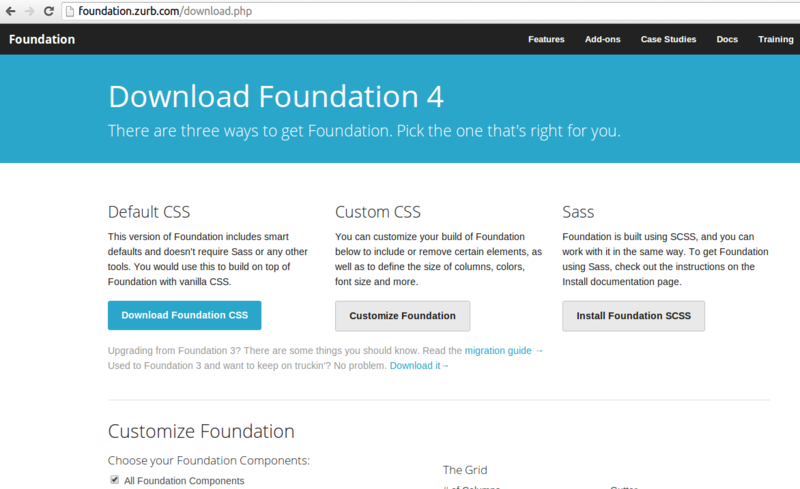 This article discussed about Foundation 4 framework. We also saw an example of Orbit feature. Hope you liked the article.